What we generically refer to as "Russian stamps" is actually referring to a number of different political entities. They are the Russian Empire, up to 1917, the period of the Russian Civil War, from 1917-1922, the Russian Soviet Federated Socialist Republic (RSFSR) from 1917-1922, the Union of Soviet Socialist Republics (USSR or Cyrillic "CCCP"), from 1922-1991, and the Russian Federation, since 1991. With the immense amount of stamps issued over the last 160 or so years, the philatelic specialization, general collecting, and topical collecting possibilities in this area are limitless! The stamps of the Russian Empire offer a wonderful opportunity for a philatelic study! Aside from the general issues, which are quite manageable, there are many watermark, paper, and perforation varieties. During the early 20th Century, the Russians experimented with varnish coating on their stamps, to prevent their cleaning and re-use, and this resulted in many minor collectible varieties. 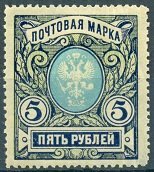 The stamps of the Russian Empire were used, in various forms, well into the Civil War period, which can yield even more philatelic varieties. The later imperial issues are not expensive, so a philatelist can acquire a lot of specialty material at a modest cost. The rather impressive looking Five Ruble stamp at the top of this page was issued about a year before the October Revolution, and its Scott Catalog value is under $1.00. A shade and a perforation variety of this stamp catalog about $3.00 each, and the most expensive Scott listed variety, an imperforate-between horizontal pair, catalogs $250.00. 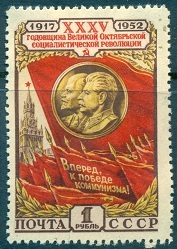 The two stamps of the Union of Soviet Socialist Republics (USSR) shown above were issued to commemorate the anniversaries of the October Revolution and the Formation of the USSR. The Russians learned of the propaganda value that postage stamps have in telling a Worldwide audience about their government, their achievements, their people, and their country early-on, and over their 75 years in existence, they issued thousands of commemorative postage stamps. Just acquiring one of each of the major stamp issues of the Soviet Union can provide the collector with many years of pleasure and enjoyment. Collecting Russian stamps has Worldwide interest, and as a result, some of the early postage stamp varieties and souvenir sheets of the USSR through the 1950's have gotten a bit expensive. But they are no more costly, overall, than the contemporary stamp issues of many widely collected European and Asian countries. With thematic collecting, one doesn't have to collect every issued stamp, and there are many topical possibilities with the stamps of the USSR. The easy ones would be Lenin, Stalin, Marx, Engels, space exploration, flora and fauna, and there are numerous other thematic subject possibilities. 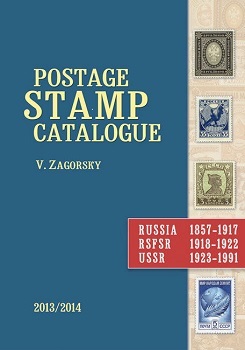 The Zagorsky catalog is the specialty catalog for Russian stamps, and the more recent editions are published in English! Click on the picture above for a link to ordering information on the Zagorsky website. The listings in the Zagorsky catalog are very similar to those used in the Michel catalogs, that is, with all the stamps, regardless of their particular categories, being listed in chronological order, as they were issued. For a new collector considering the collecting of Russian stamps, the Cyrillic alphabet and the Russian language can seem a bit intimidating. From the stamp identification standpoint though, it is really not that difficult. Learning to speak, read, and write the Russian language would be a daunting task. I took a semester of Russian in college, and I can attest that it WAS VERY DIFFICULT! I can not understand most of the written Russian language, BUT HERE IS THE TRICK to identifying most of the stamps of Russia! There are many resources on the internet, where you can find the Cyrillic alphabet. Many of them also have pronunciation aides in making the sound of each of the Cyrillic letters. With a little effort, one can memorize the Cyrillic letters and what they sound like, then it is very easy to phonetically pronounce most of the Russian words. One also needs to learn the numbers from 1 to 10 in Russian -- that is easy. Most Russian proper nouns and place names sound very similar to the way they are written and pronounced in Western languages, so with a little effort in learning the alphabet and the basic numbers, one should be able to easily identify most of the Russian stamps. 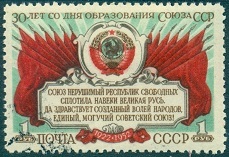 The Russian Philately website buys and sells Russian Imperial and USSR stamps and covers, including all specialized areas. Russian Philately utilizes both the Zagorsky and Scott catalog numbering systems for Russian stamps, and they can communicate in both the English and Russian languages.